Every neighborhood needs the perfect hangout, a family-friendly place to treat the kids while rewarding the grown-ups, too. But what about those grown-ups who are watching their waistlines? What about those kids who might have special dietary needs? As a Menchie’s frozen yogurt franchise owner, you’ll have your whole community covered. Not only is frozen yogurt typically lower in calories and fat than ice cream, our Private Label Collection of frozen yogurt offers options for all: Nonfat. Low carb. Selections free from artificial flavors, colors and high-fructose corn syrup. No sugar added. Greek yogurt for more protein. And it’s all kosher, too. Guests mix their own treats at Menchie’s, which means they can be as healthy as they want to be. Having those healthier options is a big draw. As a franchise owner, you can take pride in the fact that Menchie’s sources all the milk for our Private Label Collection frozen yogurt from a family-owned dairy farm in California. Also, the state’s minimum requirements exceed federal standards for levels of protein and calcium. The cows are never treated with artificial growth hormones, and our frozen yogurt has earned the live and active culture seal by the National Yogurt Association. Some 60% of consumers are on the lookout for healthier snacks, according to Technomic’s Snacking Occasion Consumer Trend Report. Industry trends show sales of frozen yogurt treats have risen an average of 21% annually between 2008 and 2015, according to CNN. At Menchie’s, guests control everything from portion sizes to the toppings on whatever froyo variety they choose. While guests can certainly get playful and creative with their mix, piling on toppings like Cap’n Crunch cereal or crushed Heath candy bars, those who are so inclined can make their frozen treat as healthy as they’d like. We offer a variety of fresh fruits and nuts in addition to our more decadent toppings. 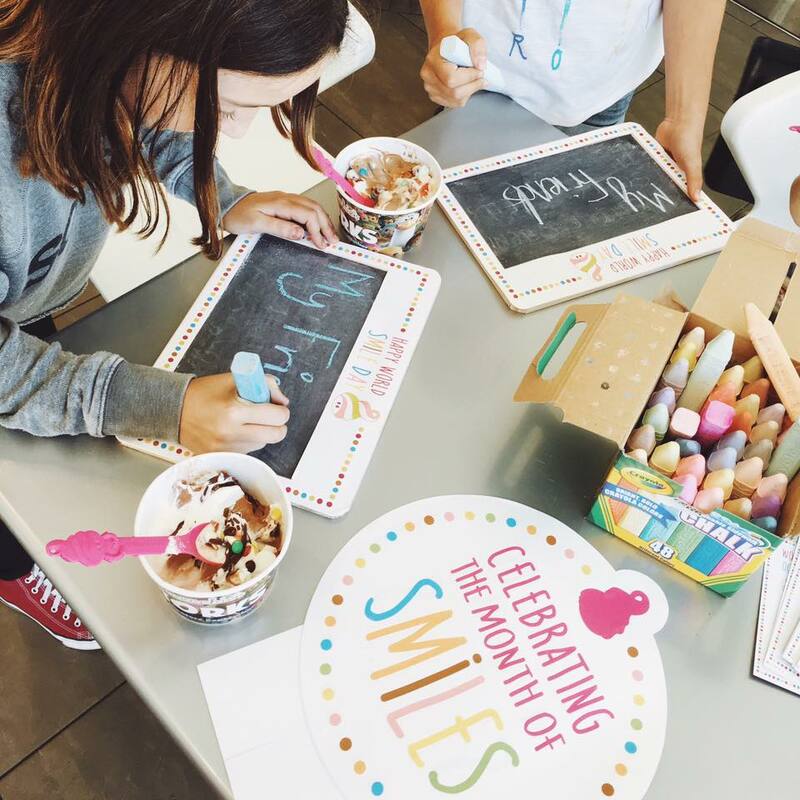 Kids love playing with our chalkboards almost as much as they love designing their own, very personal Menchie’s mix. Whether they top their froyo with fresh fruits or go all-in with cheesecake bites and hot fudge sauce, our guests love us so much they come back again and again. But why? What makes Menchie’s different from other froyo franchises? We strive to make the experience happy and memorable, every single time. Menchie’s was created to be a place where people could relax over a delicious treat and enjoy themselves. Guests love our unlimited free samples policy and our family-friendly vibe. It’s as great a place for an after-movie stop on date night as it is for a celebratory froyo waffle cone after a soccer game. We have collectible spoons, movie-themed cups, Menchie’s merchandise and interactive fun with chalkboards. 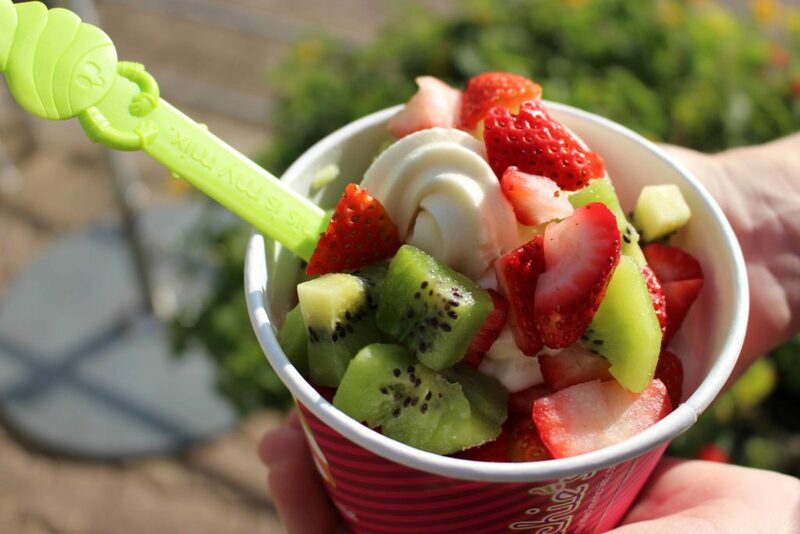 We created Menchie’s to be the most fun place to go to, for healthy treats or somewhat more decadent ones. Our successful franchise owners know the real key to bringing guests back again and again is making sure they always leave with a smile.